Even if you plan to wait for next week’s deal, definitely be sure to go ahead and now — just in case they run out of prints before then! Starburst Jelly Beans for just $0.75 at Publix! Looking for Easter candy deals? Don’t miss this deal on Starbust Jelly Beans! Yankee Candle Coupon: Buy One, Get One Free Candles! Love Yankee Candle? Don’t miss out on this coupon! There is a new available for buy one, get one free candles. It’s valid on all classic jar and tumbler candles. Valid through April 14, 2019. Stock up on baking supplies this week at Target! You can score deals as low as $0.25. 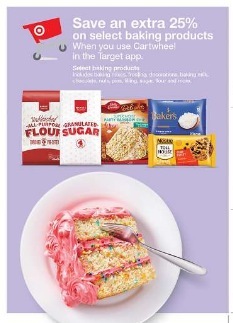 This week at Target, you can save an extra 25% off select baking products using these Cartwheel coupons! Plus, there are several coupons to stack with the Cartwheel making for some great stock up deals.